With almost 20 years of intensive study and full time practical application mastering and teaching all things Post-Processing (Lightroom, Camera Raw and Photoshop). Very few others have both the combination of expertise and teaching skills. 2. *** INCLUDE **** your name, your CURRENT EMAIL ADDRESS and the VIDEO TITLE(S) in the PayPal message line to me! If you do not do this, I will not know what videos to send you! 4. Please download the videos PROMPTLY one at a time (do not stream them!). You will have only a few weeks to do so, or the download option will expire. This is an MP4 video file. It is NOT a rental (or stream) and once it is on your computer, it will NEVER expire. 5. Please BACKUP YOUR FILES (save a copy of the file on a separate hard drive) on your computer because you only get the download once. LOST VIDEOS will be charged 1/3 price for repurchase! 6. After placing your order, usually within 24 hours, you will receive an invitation to download the video file (MP4) onto your computer. *At times, I am on the road leading photography workshops and the files may be delayed in sending. If you do not receive your videos within 48 hours please reach out to me at mark@markmetternich.com and let me know and I or a member of my team will get them out to you as soon as possible. The tutorial below "Optimizing Images for Social Media" is sold exclusively through Visual Wilderness at this time. 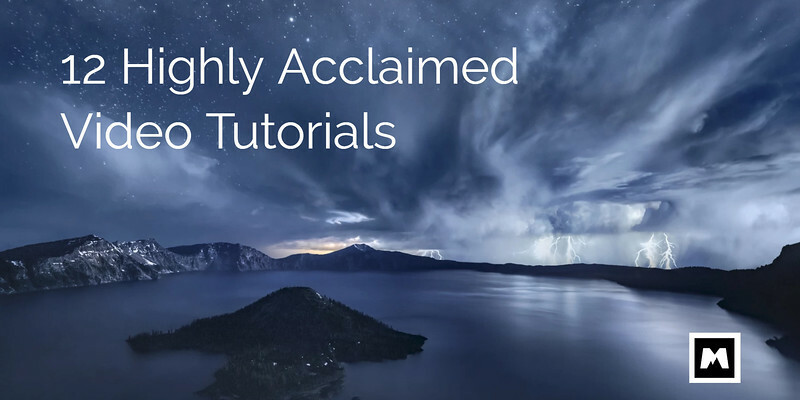 All other tutorials on my website are purchased by clicking on ORDER VIDEO TUTORIALS and following the instructions above. 2 teaching videos for nature photographers who want to to optimize their nature photos for social media platforms. 110+ minutes of video content – In-depth explanations, examples, & workflow. Clear, step-by-step process that will allow you to create stunning photos for social media platforms. TIFF file & Photoshop Action is included for practice. Find out how to optimize your photos based on specific background colors for optimal online sharing. Learn about color management standards to bring out the best in your landscape photos for online display… and even printing. Explore advanced post-processing techniques such as luminosity & color blending, grain simulation, custom sharpening, and more. Get the facts on web size and resolution standards, and how to optimize your landscape photos for individual websites. See how pros use advanced sharpening techniques to bring out detail & texture in their photos. Discover how building your own sharpening actions in Photoshop can save time. ***Must be purchased at this time through Visual Wilderness using link above "Find Out More" or clicking on the Image above. ***The BRAND NEW, completely remade from scratch, most popular video tutorial to date! Camera Raw and the Raw adjustments in Lightroom (Develop Tab) are still the very best in the business! For those wanting excellence in their photography, the raw converter is an absolute must to master! This is a totally clean, loss-less, artifact-free space inextricably connected to all the original data your camera captured. One main "secret" to masterful quality photography and clean, incredibly detailed master printmaking is getting every drop out of the raw converter! There are no exceptions to this. 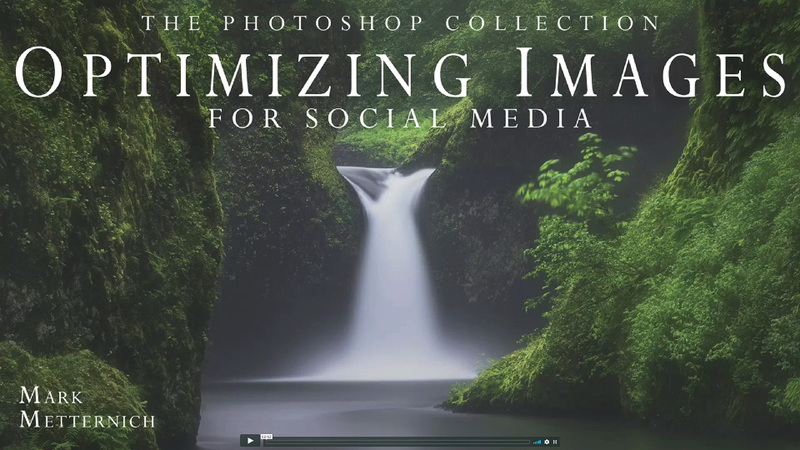 In this most comprehensive, power-packed 4+ hour video tutorial no stone is left unturned! 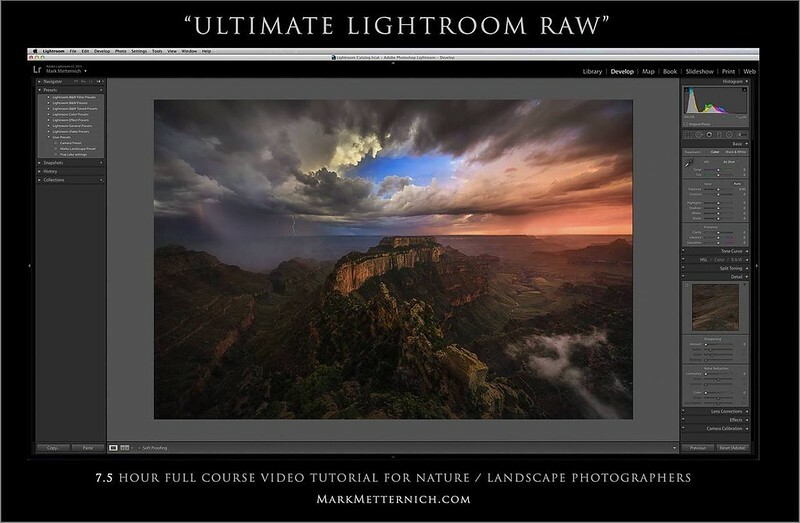 Digital Imaging Specialist Mark Metternich will take you through ALL the tools in raw to help you take your raw processing to the highest level desired or possible. Intelligent custom default settings (presets) will be discussed in length to have a much better base to begin adjustments, as well as an exhaustive workflow in Raw on several images to help teach various full approaches to mastering every facet of raw processing to produce an image that is excellent, even before entering Photoshop! A truly generous amount of free techniques are added throughout the video such as Color Management, Various Blending methods, Raw Smart Objects, Color Balancing, Localized work in Layers and so much more! *See below for recent testimonials about the video. Description: With the power of today's Raw Converters (such as Adobe Lightroom) IS PHOTOSHOP REALLY NECESSARY to get the best quality from our precious photos? ABSOLUTELY YES! There have been documented at least 65-100 critical things a photographer CANNOT do in any Raw converter, that will allow between 30-50% improved quality in anyone's precious images, whether they are “purists” or creative in their post-processing approach. Yet, today more than ever, people are starting to avoid Photoshop because of its complexity. In this "BASICS" series, Mark takes the viewer through many bare-bones basics with a very non-intimidating, easy to understand teaching style. Along the way, there are a few intermediate and advanced techniques thrown in just for fun! Volume 1 will be followed by many more in this series because of the sheer volume of power and techniques Photoshop allows the photographer. Jump in and begin to get up to speed in Photoshop for awesome imagery, with PHOTOSHOP BASICS - NO MORE INTIMIDATION! *** NEW: "COMPLETE WORKFLOW FROM A to Z"" ($99) 5.5 Hours. Description: The very long awaited (2 years in the making) Video Tutorial on Mark's COMPLETE workflow on an image is finally available to the public. Mark takes a series of 10 focus stacked images and takes you step by step through every process from Raw Capture to the finished product. Nothing is held back! More processes are taught in this intensive video tutorial than can be described here, yet with Marks approach, things are kept simple and not overly complex. The Video comes in 7 - 45-minute parts (total 5.5 hrs) all with their separate table of contents of the techniques taught in each section. Every image a photographer works on brings out different needs, approaches, and techniques. Mark chose this image specifically for its unique set of needs for maximum teaching benefit. This video is higher resolution than previous Mark Metternich Videos and the Audio has also been dramatically improved as well. Watch an image start as a washed out, bland image (not representing what was seen) to an image with all the authentic punch and pop (optimized) of the dramatic moment of light witnessed. ""SKY TIPS AND TRICKS 1"" ($59) 1 Hour 17 minutes. Description: One of the true “next levels” to excellence in landscape post-processing comes with the power and mastery of controlling skies separate from land adjustments. This unprecedented power opens an entire can of worms for control, creativity, and correction. In this short but powerful video tutorial, you will learn revolutionary sky techniques that will enable you to take your work to a whole other level. Whether you are a “literalist” who wants more correction and clean up, or a “creativist” who wants total sky power and control, this video will open up a world of possibilities. In this tutorial, you will learn things such as, but not limited to: * Separating skies from land. * The “Threshold Technique.” * Separate fine tuned adjustments to sky and land. * Tucking skies below the horizon line to clean up artifacting. * Fine tuning selection edges. * Advanced “Color Balance” techniques. * Expanding, Skewing, Warping... skies. * Filling in problematic sky areas. * Compositing. * Redefining horizon lines. * Cleaning up artifacting. * Mimicking natural horizon line feathering. * The power of the Quick Selection tool. 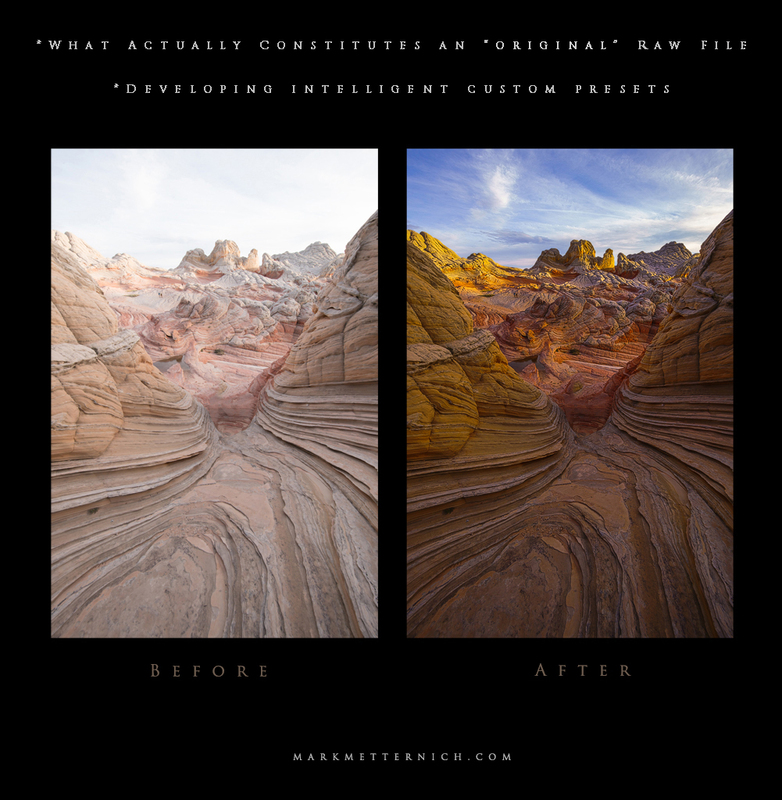 "WHAT ACTUALLY CONSTITUTES AN "ORIGINAL" RAW FILE / CREATING INTELLIGENT CUSTOM PRESETS""" ($59) 1 Hour 15 minutes. Description: There is growing confusion in the photographic community today of what actually constitutes an "original" Raw file! Is it what you see on the back of your camera when you take a photo? Absolutely not! Can intelligently adjusting or developing a Raw file in the Raw converter get us much closer to what a scene actually looked like? Absolutely! Are Raw adjustments and Photoshop really "altering" an image? What does a truly nonaltered Raw file actually look like? What kinds of major alterations have been done to your "original" Raw file before you see it either on the back of your camera or when it comes up in default settings in a Raw converter like Adobe Lightroom or Adobe Camera Raw...? Do the sliders that indicate "0" really mean "0"? No! Has nothing really been done to the file? No! The confusion around these types of questions and much more are met head-on in an easy to understand fashion. For some, this video will be truly eye-opening. The second part of the video is about taking the awesome and wonderful responsibility of building your own intelligent custom presets instead of letting a brainless camera do a sub-par job for you. Even if you are a "purist" you will see how a much better and much more "real" image can start out in your Raw converter, even if your aim is minimal post-processing. Even if your aim is total optimization or even wild creativity, you will see how to cut down your precious time in workflow and get much better results from the start! "ULTIMATE LIGHTROOM RAW" ($99) 7.5 hour FULL COURSE! 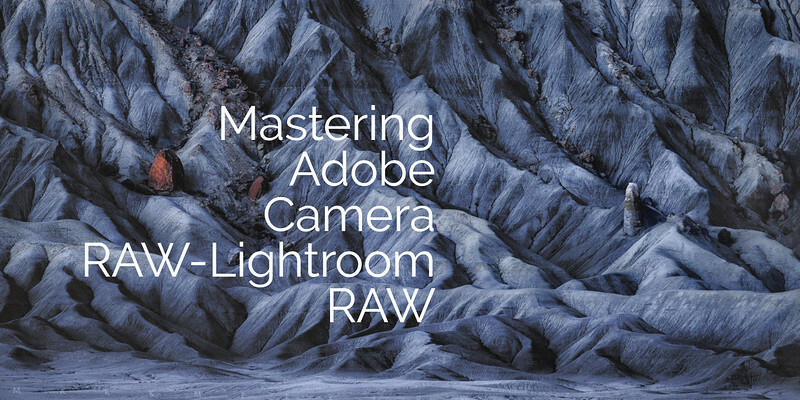 ULTIMATE LIGHTROOM RAW is the Definitive and by far the most thorough Lightroom Raw Processing Video Course (7.5 hours) on the market today for Nature and Landscape photographers! Not only are the basics covered extensively (every tool and raw process) but comprehensive workflow from beginner to the advanced photographer is covered. ULR comes with a great deal of bonus workflow instruction related to preparing images for import to Photoshop (including many key Photoshop techniques). No stone is unturned in this complete raw processing instructional package, and Mark’s expertise as a digital imaging specialist and instructor comes through in a very clear, competent and articulate fashion. "MASTERING FINE ART PRINTING and COLOR MANAGEMENT" ($59) 2+ hours. Description: Truly mastering the various processes for print can be a daunting task sometimes even intimidating. But it is also incredibly rewarding to produce a spectacular art piece from our precious images. 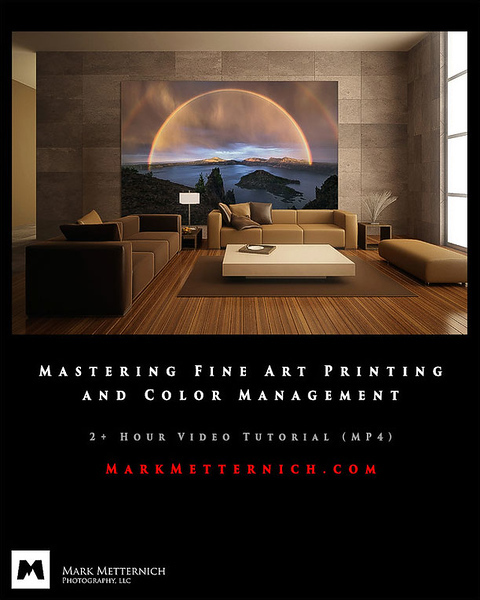 In this video, veteran master printmaker and digital imaging specialist Mark Metternich helps take the viewer through sometimes incredibly complicated jargon and techniques but makes them both "real world" and easy to apply! This video is for anyone wanting to improve the quality of their precious prints or even completely perfect the print process. Segments dealt with are: Color Space Options Soft-proofing in Camera Raw Soft-proofing in Lightroom Print vs Web Calibration Monitor Choices for Critical Editing Working Space Background Choices Evaluating the Critical Hard Proof Dealing With Labs De-saturating Tip Gamut Warning Price Structuring Lab / Paper / Mounting Recommendations *See below for recent testimonials about the video. Mark Metternich and Robert Park will take you through two intensive days of post-processing and hands-on instruction ALL THE WAY FROM CAPTURE TO PRINT with complete workflow optimization for every step enabling you to produce printed work of the highest possible quality. 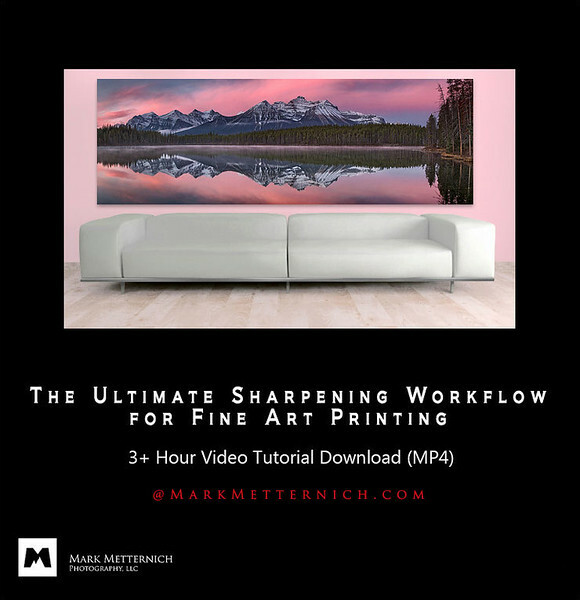 THE ULTIMATE SHARPENING WORKFLOW FOR FINE ART PRINTING" ($59) 3+ hours. Description: Any serious fine art printmaker knows that SHARPENING is one of the very most important aspects of workflow to draw out detail and make a master quality print. In fact, entire books have been written about the subject. There are a wide variety of ways to sharpen for fine art printing and the issue is very complicated with much opinion and misinformation. This video takes Marks 10 years of full time intensive, exhaustive study on the subject of sharpening and combines it with his privileged position of making top end, fine art gallery prints for countless talented nature photographers. Mark is a digital imaging specialist with extra expertise in master printmaking and especially sharpening protocol and in this 3+ hour video he holds nothing back! The video, effortlessly, takes the viewer through a 5 stage sharpening system that he himself teaches his Skype students and also employs for top end fine art clients. Mark also shares a load of valuable extra information along the way. For any serious printmaker (from beginner to master printmaker) desiring the very best quality workflow, this may be the best sharpening video on the market. The techniques drawn from it come only from the greatest gurus in the business. *See below for recent testimonials about the video. 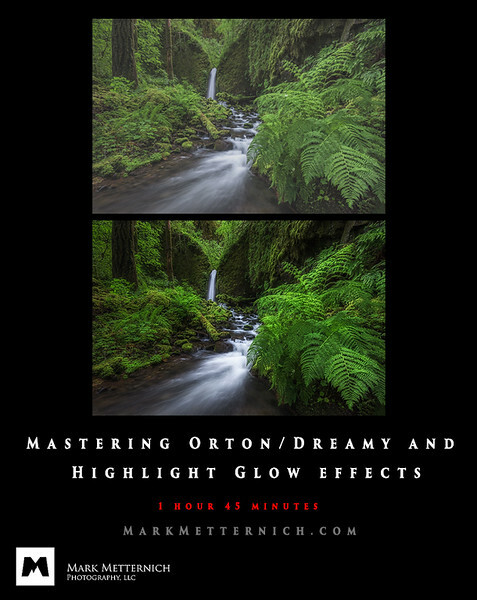 "MASTERING ORTON / DREAMY and HIGHLIGHT GLOW EFFECTS" ($59) 1 hours 45 minutes. Description: When used with advanced methods and great care Orton, Dreamy or Highlight Glow types of effects are often a wonderful secret weapon in the arsenal of advanced landscape and nature photographers. The video tutorial "Mastering Orton / Dreamy and Highlight Glow Effects" gives a general layout of the development and history of Orton / Dreamy and Highlight Glow types of effects in digital post-production and takes the viewer through a diversity of approaches (from simple to advanced) that have been developed by various top photographers over time. Laid out is the most flexible and least destructive ways to use various global and localized glow effects. Also laid out is a very creative and unusual way to easily create your own custom personalized effects. Everything is hit on in the video including 3rd party effects like Nik and various approaches to layer masking. *See below for recent testimonials about the video. "FOCUS STACKING / BLENDING (for Depth of Field) MADE EASY" ($59) 1 - 1/2 hours. Description: Mark Metternich has been a pioneer in focus stacking/blending for over a decade now. Having been working full time with these techniques (including manual blending) and teaching them, he has been ahead of the game with many methods just now getting popular with modern photographers looking to enhance the quality of their work. In this fabulous, info-packed 1-1/2 hour video Mark takes the somewhat complex and often challenging techniques (both in the field as well as behind the computer in post-production) and makes them simple enough to easily employ in your own photography to overcome the limitations of your camera and lenses. You can now produce stunningly sharp and amazingly detailed images from the closest foreground object to the furthest reaches of the background. These techniques greatly enhance the quality of any photography including any serious printmakers work. Methods will be discussed for Adobe Lightroom, Camera Raw, and Photoshop workflows. With Mark's easy to understand teaching style you will be well on your way to stunningly sharp images with maximum depth of field in no time at all! Many extra goodies are shared along the way. *See below for recent testimonials about the video. "BLENDING FOR DYNAMIC RANGE MADE EASY - BLEND IF" ($59) 1 1/2 hours. Description: When used to their full potential, the Layer Style "Blend If" sliders are "holy grail" of advanced blending in Photoshop! They are some of the least understood, least used, least exploited, yet most powerful and easiest ways to deal with many blending issues, including dynamic range. Instead of complicated layer masks they have the ability to replace most masking techniques for quick and easy, real-time dynamic range blending. If you like simplicity, yet not at the cost of sacrificing power, "Blend If' is for you! 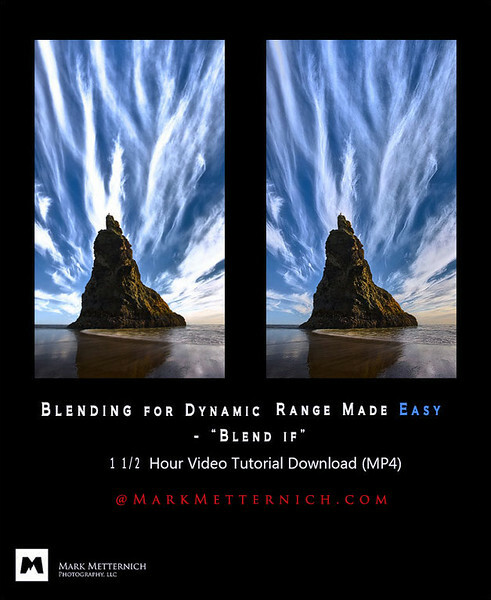 In this 1 ½ hour intensive video tutorial, digital imaging specialist Mark Metternich takes you, step by step, through the general workflow for easy, advanced blending for dynamic range using the “Blend If” sliders. 5 separate images (with different needs) are all taken through the workflow and both highlights and shadows are repaired in an easy, clean and lossless manner. Other techniques using “Blend If” are touched on, including subtle advanced Dodging and Burning. *See below for recent testimonials about the video. 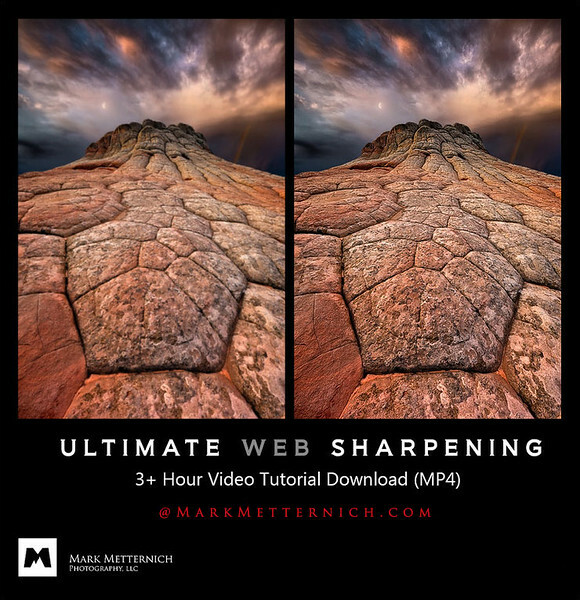 "ULTIMATE WEB SHARPENING" ($59) 3 hours 15 minutes. Description: The most powerful and comprehensive web sharpening video has arrived on the market! With a myriad of sharpening techniques out there including third party programs, it can be very hard to cut through the clutter and figure out what the very best techniques are and how to have TOTAL CONTROL of sharpening for web presentation. Ultimate Web Sharpening takes the viewer through the evolution of fine art sharpening for web and, step by step, shows how we have arrived at where we are today. Then the video takes a refreshing turn, by cutting through the clutter and laying out what many of the top photographers are doing today to truly maximize their web sharpening. This video is not a one button push for good web images. What it is, is a comprehensive look at, and approach to getting the very most out of fine web sharpening. Although the video does give general linear steps to follow to maximize workflow, it also greatly encourages creative, custom, experimentation of the techniques/tools to find your own “best” way to use the best tools we have today for web sharpening, with some critical secret twists. Video is 3 hours 15 minutes. 14. Summary *See below for recent testimonials about the video. Matt Kocin said: "I have both the blending and the RAW processing videos, and while both are great. The RAW processing tutorials have probably made the biggest and best addition to my photography post processing techniques since I started post processing my photos! Such a large difference that I actually started going back and re-editing old photos. So, just wanted to say thank you so much! If anyone is hesitant about picking these up, don't be!!!" 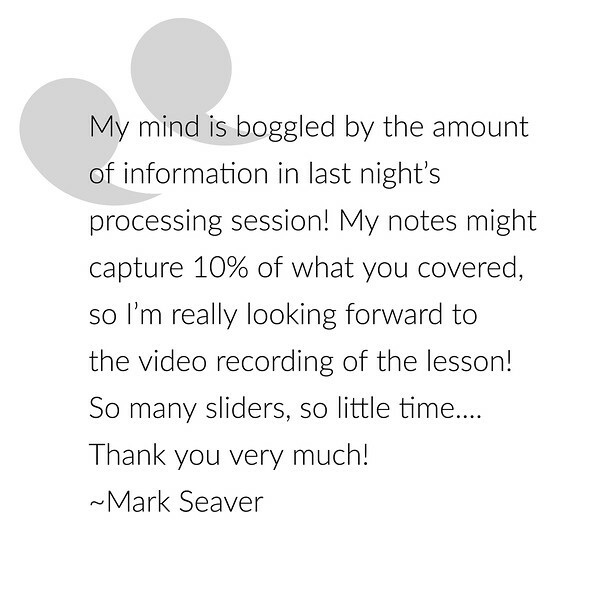 Mitchell Derr said: "Mark, I have to say your RAW processing video was really good! I cant wait to see the Lightroom and Blending ones! Thanks. "I am a private Skype student of Marks and last week he showed me this technique via an online lesson and, literally, my jaw dropped to the floor! My immediate reply was 'Wow, that is going to save me countless of hours!' If one wants to use complicated masking, that is perfectly fine, but honestly I don't see the need anymore." 2. "Photoshop BASICS (Part 2)" 3. "Lightroom BASICS"
4. "Adobe Camera Raw BASICS"
5. "Long Exposure Landscape Photography"
6. "Mastering BASIC Masking Techniques (in Raw and Photoshop)"
7. "Mastering Advanced Masking (in Raw and Photoshop)"
8. "Color Management Made Easy"
9. "LAB Mode - a Secret Weapon for Post-Processing and Color"
12. “In the Field Shooting Tips 1"
13. "Advanced Scouting with Google Earth and GPS"
14. "Mastering Composition in Landscape Photography"